Since childhood had an uncommon interest with Radha-Krishna Love. The school syllabus had poems those triggered my interest to the next level, while 89/100 story, with my crazy innovations took me to a different horizon altogether…! the eighth incarnation (Avatar) of Vishnu, and his Shakti Radha (Devanagari: राधा)such was the love of Radha towards Krishna that they became one. The Nimbarka sampradaya worship of the youthful Krishna, alone or with his consort Radha, is one of the earliest dating at least to the 12th century…. Bengali literature, during the early phase, gives a vivid description of the portrayal and evolution of understanding of Radha and Krishna. Baru Chandidas is a poet notable for being a prominent Early Middle Bengal historical figure; the date of his poem Srikrsnakirtana is still under question however the text remains one of the most important evidences of early portrayal of the popular story of “Lord Krishna’s love for the cowherd girl Radha” in Bengali literature and religion. 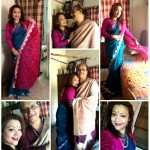 However, my 89/100 #100sareepact neither has images of Radha/Krisha, nor reflects any love-poetry in saree design. It simply represents two bright colours – Gold Yellow and Candy Red. The entire body is full of patterns & designs in black, as if painted like ‘alpona’ with poster -colour neatly. For me, these two sunny colours, Yellow & Red symbolize the super combination of our own Radhachura & Krishnachura, i.e. Yellow & Red coloured Gulmohor trees.in Bengali ! 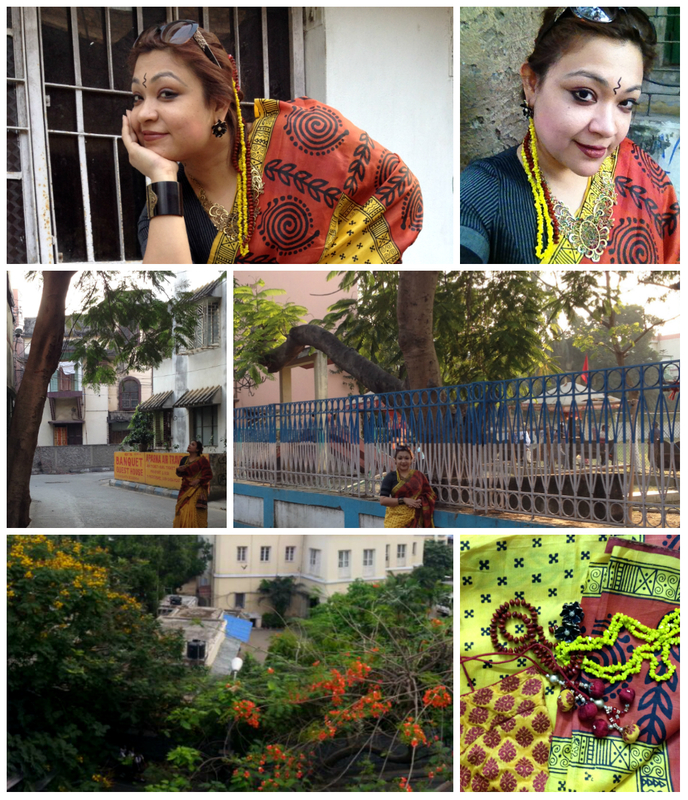 This year when the sareepact series started the Radha-Krisha ‘spring’ celebration of Gulmohar trees were almost over. I desperately tried to find this couple, next to each other but failed miserably. One of my closest pals shared a wonderful photograph of what I was searching, from his rooftop…!! My saree shooting took place in our locality, where Appa was my ever-tolerant photographer who waited, walked, took snaps keeping my story theme intact. Do share feedbacks my friends, how my Radha-Krishna affair got expressed in this 89/100 #100sareepact tale….